Here’s one of the best parts of having an empty nest: you can decide on a Wednesday that you want to get away and two days later you can be in a different city enjoying the local cuisine. There’s no need to worry about missing weekend activities, you don’t need to make elaborate packing lists so everybody has everything they need, nobody gets bored and cranky during the car ride, and best of all, once you’re at your vacation spot, you can do whatever you want without worrying about whether something is child-friendly. My hometown, Atlanta, is a wonderful spot for a quick weekend getaway. While there are tons of activities for the whole family, as an empty nester you can focus on the things you didn’t get to enjoy when you were traveling with your kids. Here are some suggestions for the perfect empty nester three day weekend in Atlanta. There’s plenty to do and three days is long enough to feel like you’ve really seen the city. In a treehouse, of course! 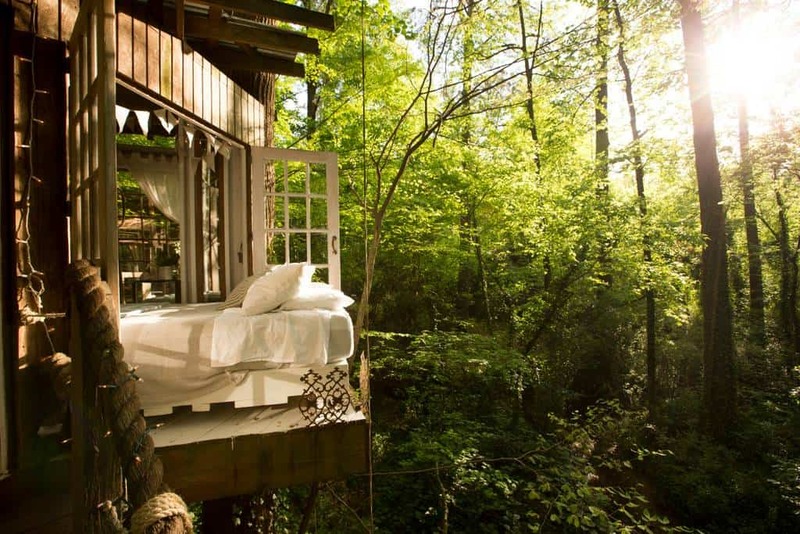 Airbnb most wished for listing is this beautiful treehouse in the posh Buckhead neighborhood in North Atlanta. But if you can’t get a reservation (it’s frequently booked solid), there’s no need to worry because there’s an equally beautiful treehouse conveniently located on an intown farm with alpacas, llamas and chickens in East Atlanta. If a treehouse isn’t your thing, you can still find condos and apartments located close to downtown for less than $125 using Airbnb. Use this link to book your first trip with Airbnb and get $40 off the price of your stay! While Atlanta does have public transportation, the subway system (MARTA) is fairly small and pretty much services just the main downtown area. If you want to see everything Atlanta has to offer, you’ll either need your own car or be prepared to use Uber or Lyft. My husband I frequently use Uber or Lyft when we want to head to something in the downtown area simply because we don’t have to worry about finding a place to park or having to pay for parking if we find a place. Download the Lyft app using this link and receive a discount on your first few rides. Start your first day in Atlanta with some shopping on the Westside of town. The Westside Provisions districts hosts several unique, upscale shops such as Ann Mashburn (upscale classic clothing), Hudson Grace (elegant and timeless decor), and Little Barn Apothecary (natural and organic skin- and self-care products). 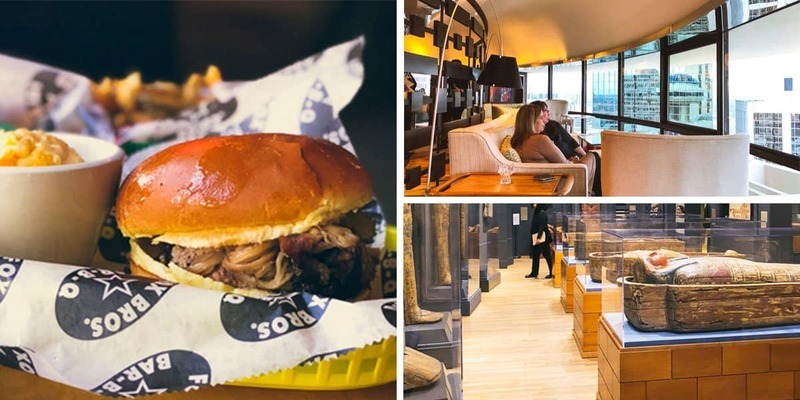 Grab a quick bite at JCT Kitchen for a modern twist on old-style southern food or head over to Castleberry Hill for some classic southern soul food at Old Lady Gang. After lunch, we’re going Hollywood! Did you know that many of your favorite movies and TV shows were filmed in and around the Atlanta area? The state of Georgia offers generous tax incentives to the movie and TV industry and at any given time there are multiple movies and TV shows filming around the area. If you liked The Walking Dead, Stranger Things, Ozark or any of the Marvel or Hunger Games movies, then you’ll love seeing some of the spots where these were filmed. The Best of Atlanta Film Tour takes you on a 3-hour tour of some of the most iconic filming locations in Atlanta. You’ll see where scenes from the Hunger Games and The Walking Dead and other movies filmed in Atlanta, such as Tyler Perry’s Madea movies. If you’re a Walking Dead fan and want a tour focused entirely on the show, check out The Walking Dead Big Zombie Tour to see all the hot spots from that show. 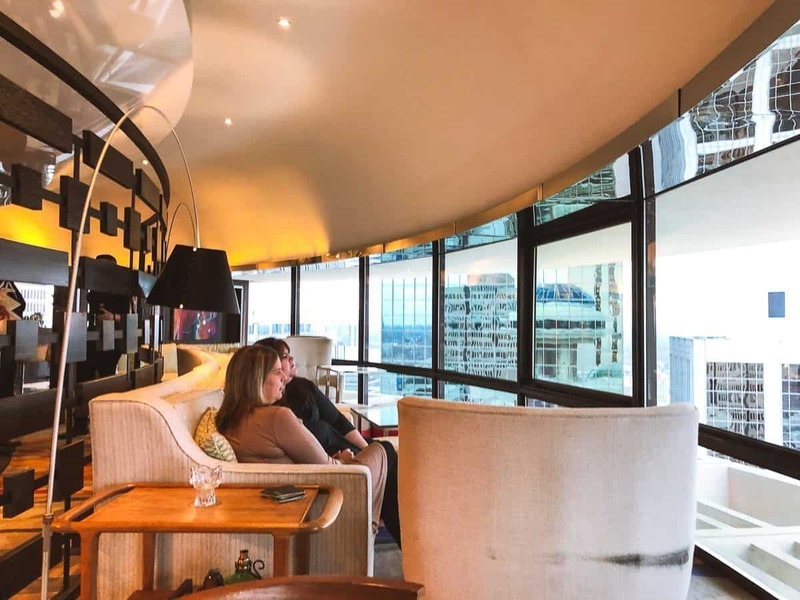 After your tour, head over to the Hyatt Regency to watch the sunset while you sip a cocktail in a rotating blue dome high above the city. When I was a child, that blue dome was the tallest building in Atlanta (now it’s dwarfed by the skyscapers around it) and was my family’s go-to place to take out of town visitors. It recently reopened after a long renovation and is still one of my favorite places to experience the city. It’s a wonderful place to leisurely relax and take in the view for the hour it takes for the dome to fully rotate. Ask your waiter to point out the rooftop bee garden where bees made the honey for your cocktail. 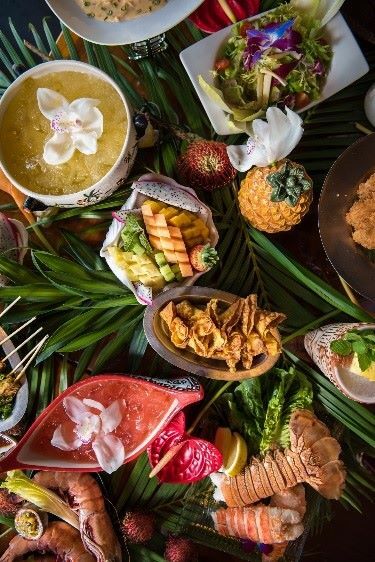 After you’ve been to the top, head down to the basement of the Atlanta Hilton for the perfect tourist-style dinner at Trader Vic’s. I’ve got to confess I’ve got a soft spot for Trader Vic’s dating from my childhood when I thought it was the most glamorous place one could possibly dine. My definition of glamour has changed a bit since then, but I still think it’s a wonderfully fun place to fully lean into the tourist experience. Try the Grilled Sake Hanger Steak and save room for one of their signature Mai Tais. If you’re looking for something a bit classier, then Ray’s in the City offers upscale dining with steak and seafood and live jazz on the weekends. Head over to Home Grown Atlanta to enjoy a traditional southern breakfast while you listen to the soothing sounds of the marimba. 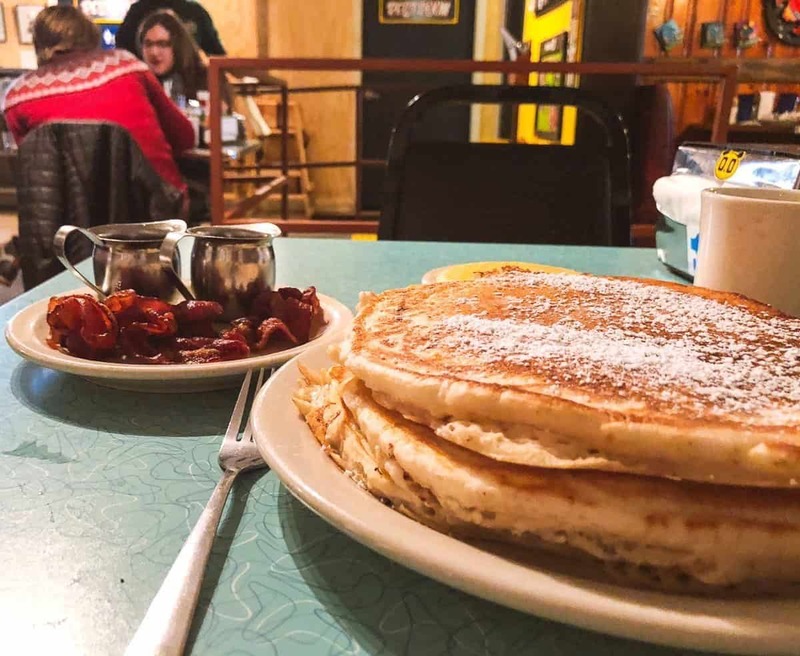 You can’t go wrong with their stack of pancakes: 3 thick pancakes the size of a dinner plate. Ask for extra syrup and get a side of their perfectly cooked bacon. You’re going to do a lot of walking today so eat up! 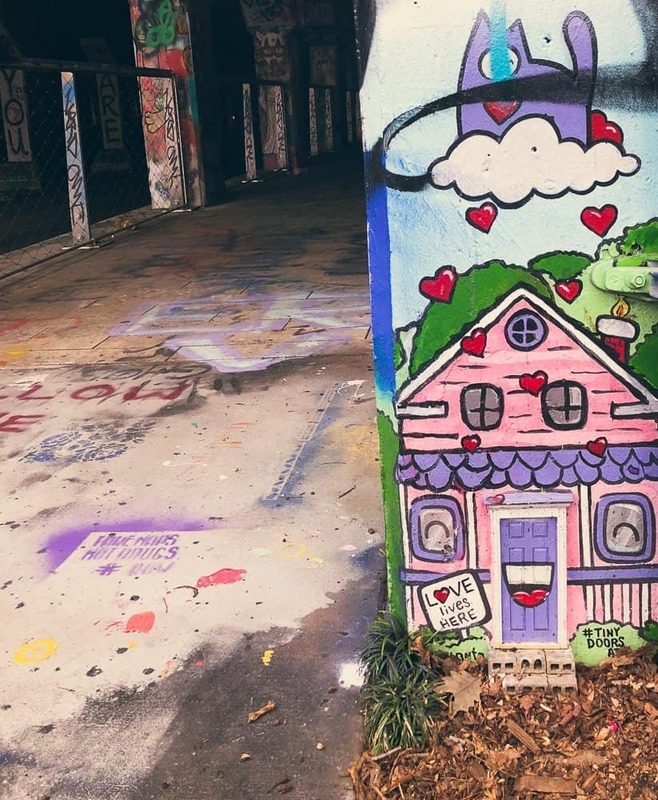 Start your walking tour of the Atlanta neighborhoods by heading over to Krog Street Tunnel to admire the colorful graffitti art. Local artists work in the tunnel every night so you’ll always see something new. You’ll probably see some of the many photo shoots that take place in and around the tunnel. Check out the amazing murals as you stroll down the path outside the tunnel on Wylie Street and look for the tiny door outside the tunnel. This door was the first installation from Tiny Doors Atlanta, an art project designed to install six inch, beautifully designed doorways at various strategic spots throughout the city. You’ll be passing by a few of these doors during your walk today – see which ones you can spot by checking the full list of doors. When you’re done viewing the murals on Wylie Street, head through the tunnel toward DeKalb Avenue and then keep going down Krog Street toward Inman Park and the Atlanta Beltline. Stop in Krog Street Market to check out the stores and restaurants housed in a former stove factory. If you’re ready for lunch, there are tons of choices here, but don’t worry if you want to keep going. You’ll pass by many amazing places to eat during your walk. 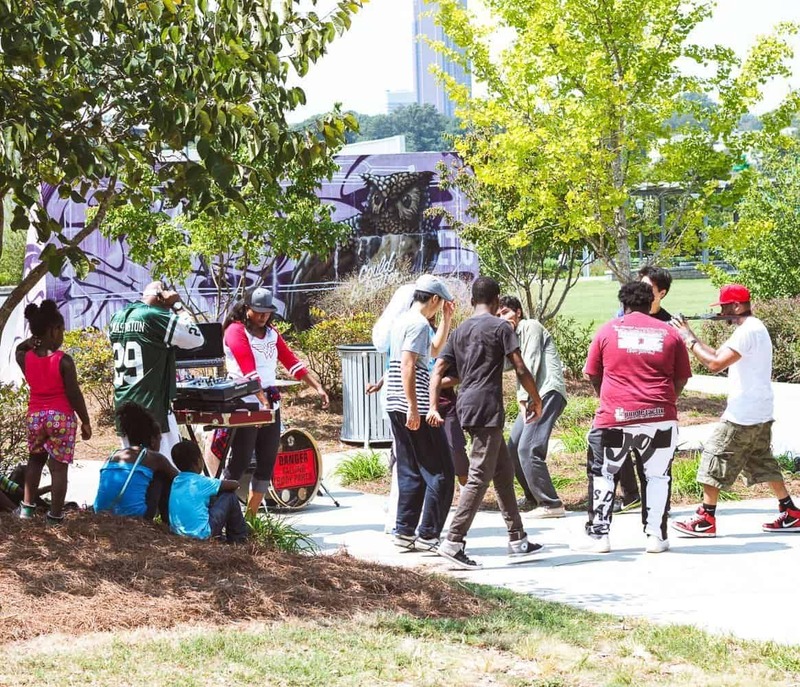 After you pass Krog Street market, head down Irwin to the start of the Atlanta Beltline. The beltline is an ongoing Atlanta project to take former railroad tracks that circled the city and turn them all into paths. When completed, the entire city of Atlanta will be circled with walking trails and parks. The Eastside section is the oldest section and has so much to do that I’ve already covered some of the highlights in an earlier post, Biking the Atlanta Beltline. You can walk or bike down this part of the beltline. Be sure and stop in Paris on Ponce to check out all their unique treasures for your home and to spy the Tiny Door just outside the store near The Eiffel Tower. And just down the path near the Old Fourth Ward Skatepark is yet another door, on the Freedom Parkway overpass. Stop for lunch (if you haven’t already!) at Ponce City Market, one of Atlanta’s newest development projects with stores, restaurants, office spaces and apartments housed in the Sears building my mom used to work at. The food hall is a great place to grab a quick lunch. My personal favorite is Hop’s Chicken, but you can’t go wrong with anything you choose. For an afternoon of fun and games, head up to the roof to visit Skyline Park, an old-timey amusement park where you can enjoy mini golf, rides, and games of skill along with one of the best views of the city. 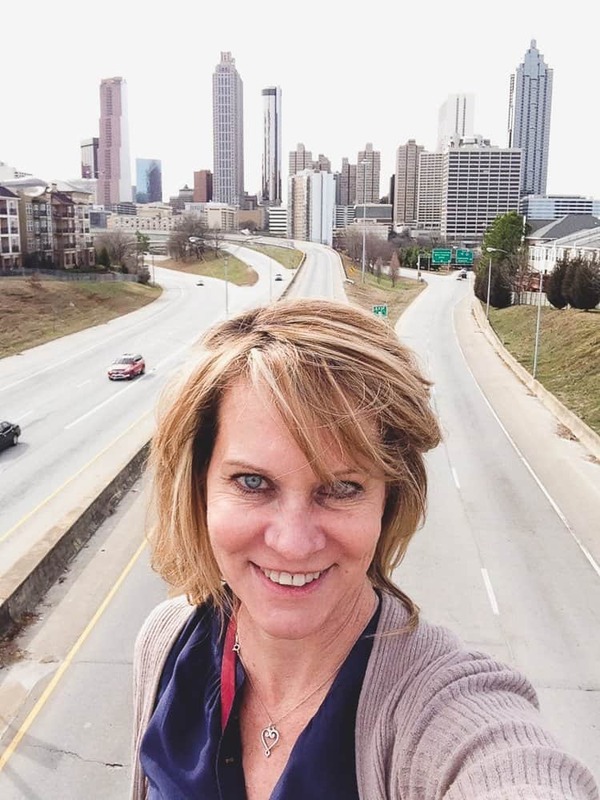 Once you’ve had your fill of fun, catch an Uber or Lyft over to the Jackson Street Bridge to snap a selfie in front of a beautiful skyline view of Atlanta at sunset. If you’re a Walking Dead fan, you’ll definitely recognize this view. 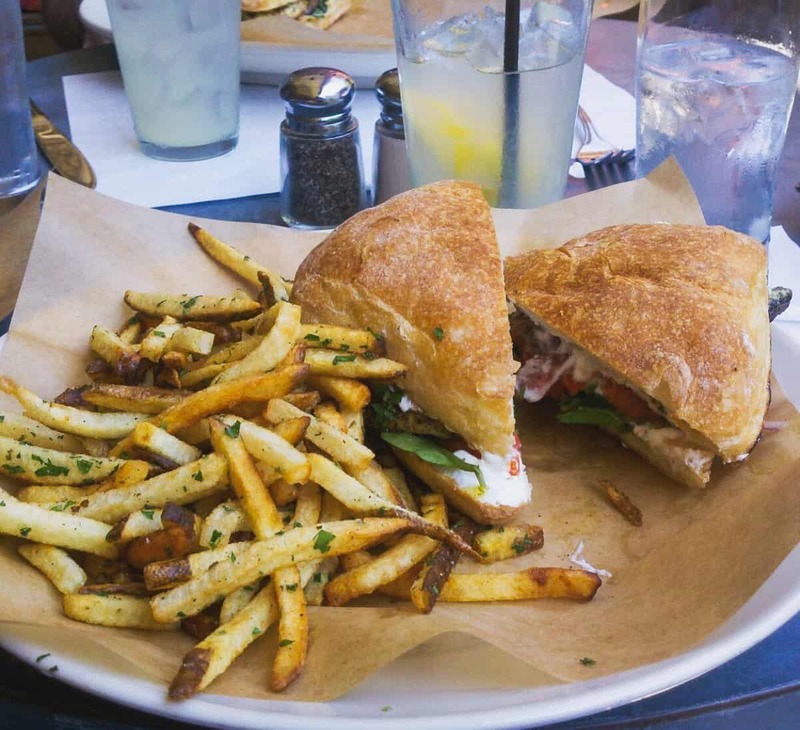 When you’re ready for dinner, head over to One Eared Stag, a charming and cozy restaurant located in the Inman Park neighborhood of Atlanta. Everything on the menu of this farm-to-table restaurant is delicious but if you want to indulge in the best burger you’ve ever had, tell the waiter you want the meat stick. 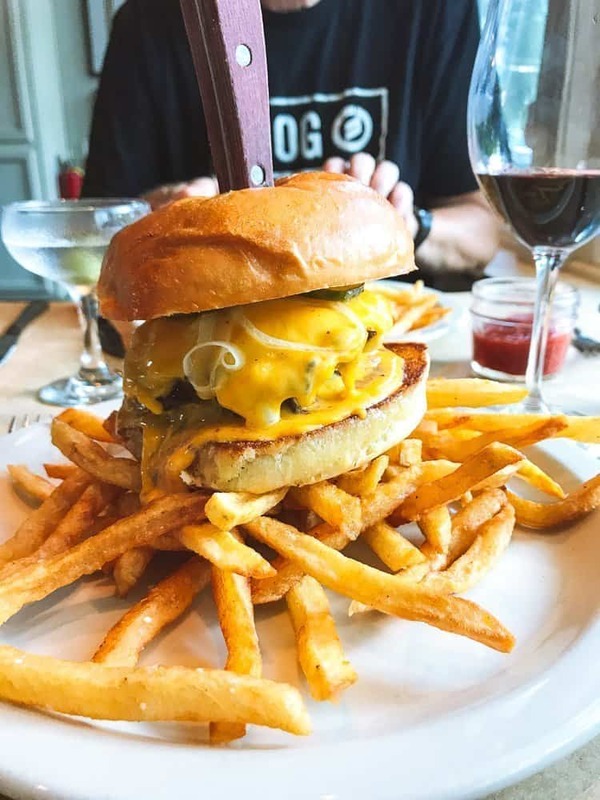 This off-the-menu treat is a double-patty burger topped with American Cheese and grilled onions and is my personal choice for when I want a decadent reward after a week of virtuous eating. If you’re in the mood for some great live music after dinner, check out what’s playing at Eddie’s Attic, Smith’s Olde Bar, or the Variety Playhouse. These music venues always have something fun going on. Start the day off right with breakfast at Gato, a funky little diner in the Candler Park neighborhood. The Flying Biscuit Cafe is better known and right across the street, but I prefer the food and chill vibe you find at Gato. You can’t go wrong with either place though. Walk off your breakfast with a stroll through the Candler Park/Lake Claire neighborhoods, one of Atlanta’s most unique areas. If you head west, you can walk past Candler Park and visit the goats at Mulberry Fields, an in-town garden in Candler Park. Or you can head east to the Lake Claire Land Trust, a truly unique neighborhood park owned and managed by the Lake Claire neighbors. 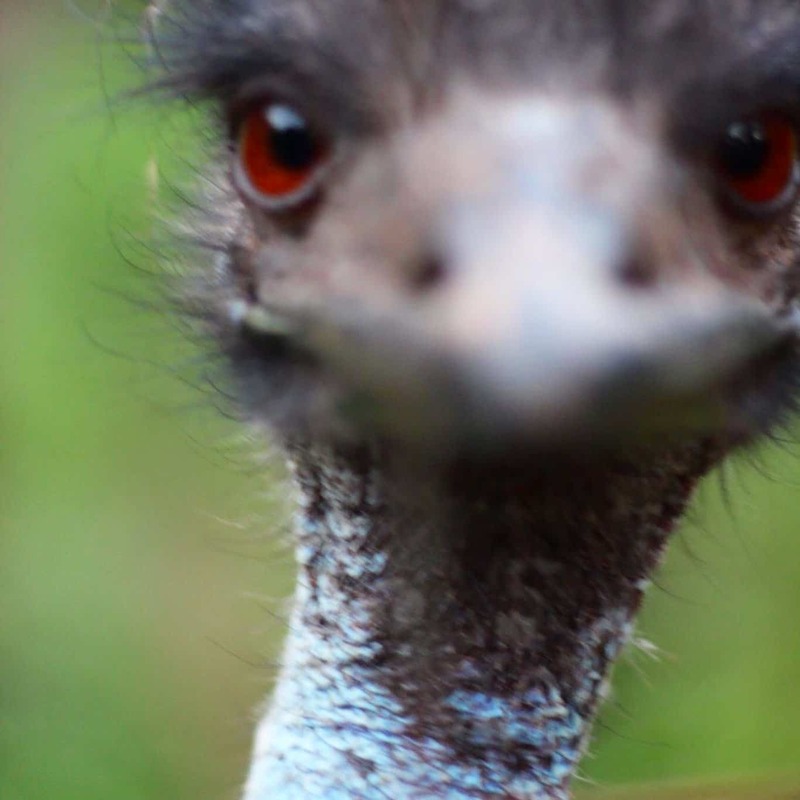 Follow the self-guided tour to see all the Land Trust’s hidden treasures and be sure to stop by and visit with Big Lou the Emu, the friendly neighborhood emu. If you took the west route, walk down DeKalb Avenue to the Inman Park Marta Station. If you went east, you can head over to the Candler Park Marta Station, also on DeKalb Avenue. 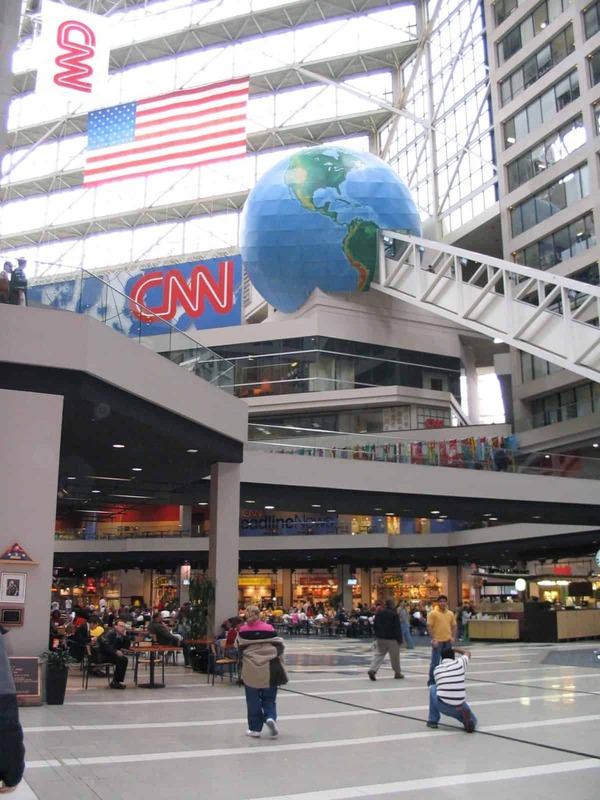 No matter the station, take the next Westbound train to the Five Points station and then head over to the CNN Center for a behind the scenes tour of America’s first 24-hour news channel. You’ll take a ride up the world’s tallest escalator and see just what it takes to create a news broadcast and send it out over the world. My personal favorite part is being able to see all the various reporters on camera waiting for their chance to report. 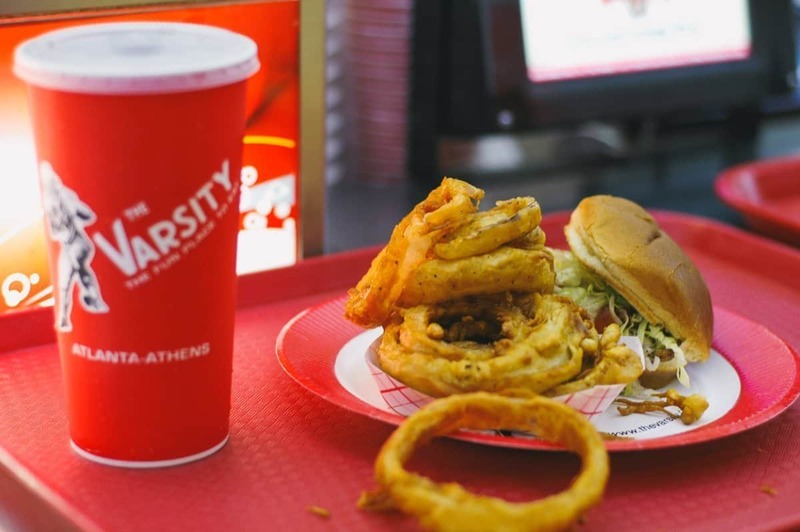 No visit to Atlanta is complete without a trip to the Varsity, an Atlanta institution since 1928. My mom and dad had their first date at the Varsity and I’ve enjoyed eating there many, many times in my life. Get a hot dog (automatically comes with chili – you’ll have to tell them if you want them to leave it off), an order of the best onion rings on the planet, and a frosted orange. You can get your meal in the restaurant or order and eat in the comfort of your car. The Varsity is very near the Atlanta’s High Museum of Art, always a wonderful way to spend an afternoon. I particularly love their collection of Outsider Art. But if you’re looking for something a little bit different, head out to the Emory University campus and check out the Michael C. Carlos Museum. 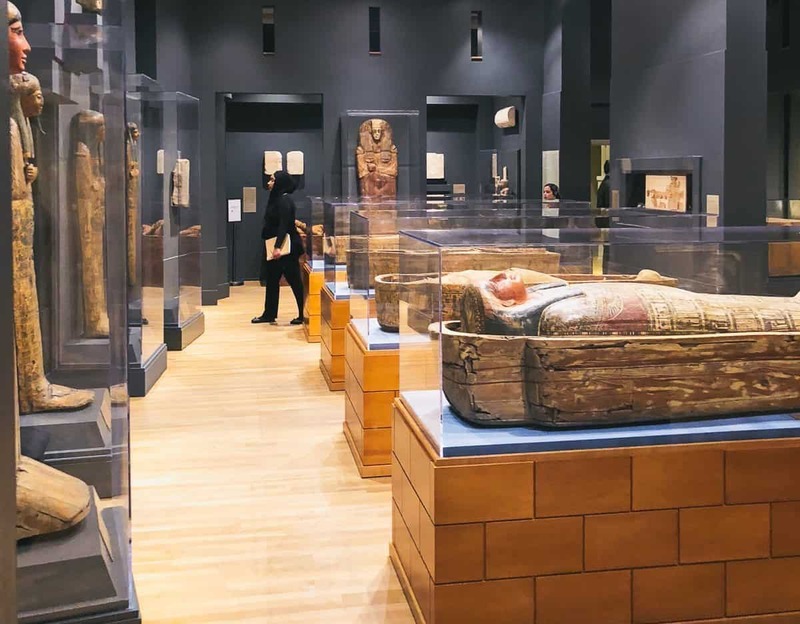 This tiny gem (you can easily see the whole thing in an hour or two) contains a fabulous collection of Egyptian Art including several mummies and ornate sarcophagi (that’s the plural of sarcophagus you guys). But I really enjoy all the well-curated collections, especially the art from the Early Americas. 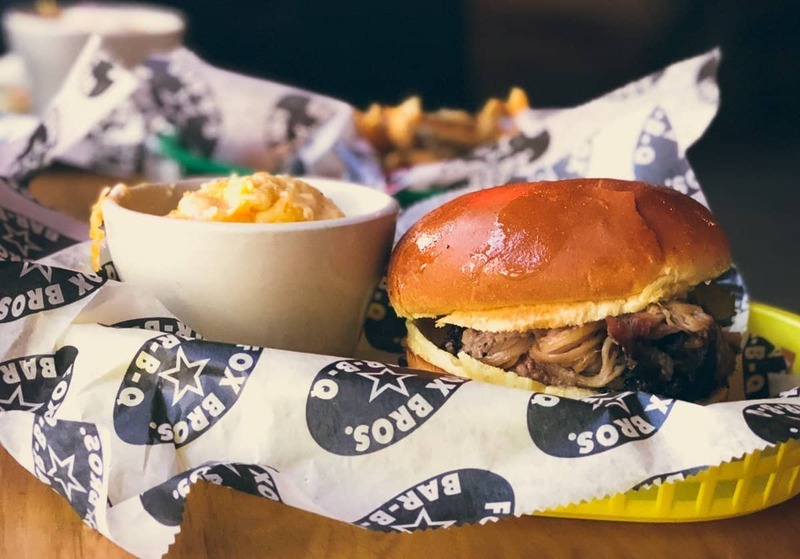 You can’t leave Atlanta without having some barbecue and some of the best barbecue in Atlanta can be found at Fox Brothers. This Texas-style barbeque is rich and tasty and their Southern sides are to die for. Save room (if that’s possible) for dessert too. Barbeque this good always draws a crowd so expect to wait no matter what time you go, but believe me, this food will be worth the wait. If you decide to visit Atlanta, drop me an email! We can look at emus and pig out on barbeque. I know you’ll enjoy the trip.